-Hilary completed Session C of the USDF "L" Program. 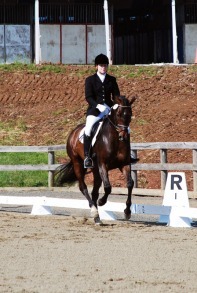 -Hilary and Holiday earned 4th overall in the Third Level Championships and have now qualified for the 2010 CBLM Championships at Third Level. -Jennifer Foulon and Ferrero won the First Level JR/YR BLM Championship and Reserve Championship at Training Level JR/YR!!! -Holiday's debut at Third Level earned him a slot at the 2009 BLM Championships! Holiday also earned a Region 1 qualifying score for Second Level 4 at the show, receiving 8s on ALL of his renvers work the entire weekend. -Hilary successfully completed the Advanced Lungeing of the Horse and Rider workshop for the USDF Instructor Certification. She "passed" the workshop and is now allowed to attend Pre-Certification. Instructor, Christine Rivlin, noted Hilary's calm demeanor when lungeing and mothe highest mark of "Excellent" on most aspects of her evaluation form. -Hilary and Holiday were just named the First Level High Score winners with a 68.421% for the 2008 Chapter Challenge in the January PVDA Newsletter. -Congratulations to Gentle Giants Draft Horse Rescue for a successful fundraiser/Wine Tasting and Blair for her winning bid on a private dressage lesson. -Congratulations to Hilary and Holiday - 2008 PVDA Chapter Challenge Championship Team members and First Level high score of the show.